A former Rotherham Council depot is set to play a key role in powering the renewable energy plant at Templeborough that is set to open in August 2017. The biomass-fired power plant will need an estimated 260,000 tonnes of locally generated waste wood per year and providers, Stobart Biomass Products is progressing plans to create a waste wood processing plant at the former council depot of Greasbrough Road. Construction began on the £150m biomass project in 2015. The development at the Firth Rixson Ickles Works will generate heat and power from carbon-neutral renewable wood pellet fuel. It will generate around 41MW of green electricity every year - enough to supply 78,000 homes and save over 150,000 tons of CO2. 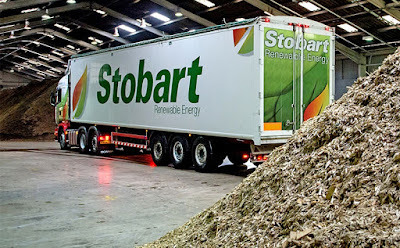 Stobart Biomass Products Ltd., a subsidiary of the Stobart Group, who also part own the Eddie Stobart logistics company, is supplying the waste wood having signed a 20 year contract. The plant requires 40 lorry loads of waste wood chip every day to generate the amount of power it is hoping to achieve. On average every person in the UK generates approximately 100kg of waste wood products per year, so the Yorkshire and Humber region alone generates over twice the amount of waste wood that is required by the plant. Rotherham Council has had the North Drive site up for sale for a number of years having moved to a new depot at Hellaby in 2010. The latest plans involve the demolition of the former depot and the erection of a waste wood solid biomass preparation facility, to mainly supply the Templeborough Biomass Power Plant. The site is set to comprise a large materials reception, handling, preparation and storage yard where materials are received, prepared, blended and stored. All biomass material processed and manufactured on site will be exported for sale and use for renewable energy generation and will be supplied to a strict specification. The depot site will be permitted to accept a maximum of 150,000 tonnes of waste per year and operaters will use dust control and mitigation measures regarding the storage and processing of materials where shredders will be capable of processing between 40 – 80 tonnes of mixed wood per hour. As part of the plans for the Templeborough plant, where 40 fuel lorries per day are expected, permission was also granted for timber pre-treatment activities to be undertaken on land on the Shenker rail sidings site with a conveyor system set to take the wood pellets over Sheffield Road to the Firth Rixson site.